Clean your casements with a new cleaning approach that has met the demands of over 94% of our customers in Leabridge! Q: How is your window cleaning Leabridge going to renew the clarity of my sills? In-house window treatment – The experts will wash dirt with ladders and squeegees. A: If you spot rainy clouds on the day of your appointment, don't be upset. The window cleaners in Leabridge can still do the service as long as they're facing a light shower. However, in the event of a cloudburst, we will kindly ask you to put off your appointment to avoid any mishaps. A: Yes, you can! The washing team will require a free parking spot in close proximity to your building (30 metres or less) and on the same side of your panes. A: It's no problem for the specialists to rinse the outer surfaces of your windows as long as they are free to enter through your front gates. And if blemishes have landed on your interior surfaces as well, just let us know and we'll carry out a free key pick-up and delivery. A: Yes we're qualified to clean any type of casement or window part. In addition, every PVC or UPVC frame or ledge will be cleaned for free! With window cleaning in Leabridge, you'll give your panes the proper clean they deserve... at custom-tailored price rates that will fit your budget! Don't believe us? Scatter your doubts by consulting our price table below. 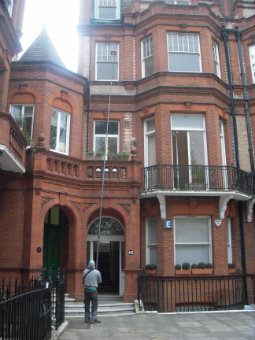 We've designed our window cleaning in Leabridge with flexibility in mind. As a result, our service is now frequently scheduled by business and household clients alike. Let's have a look at our window cleaning choices on offer. With our external cleaning, you can easily polish the panes of any property with four or less storeys. The seasoned experts will appear in a cleaning caravan. The window cleaners in Leabridge will then attach a handy water-fed rod to the van's water storage. The special filtrated water will be released through a brush-head add-on at the pole's end under powerful pressure. When the liquid vanishes under the sun, your windows will stay spotless for weeks to come. For premises above the fourth storey, we'll send in practiced abseilers for rope access window washing. Carrying sturdy ropes, cherry pickers, and ladders, they will assess and renew any skyscraper in a matter of hours. Should you need risk appraisal reports, we'll readily provide them for you. We also take our tasks to heart and will adhere to all safety regulations. If your windows are soiled on the inside as well, the specialists can perform interior cleaning with ladders and sponges. We are pleased to announce that our window cleaning in Leabridge has been scheduled by several bordering regions as well. You can check which districts we visit below. For those of you who'd rather book window cleaning services Leabridge E5 online, fill in our get a free instant quote form.